It seems that Woody Allen is hell bent on releasing at least one new film each year, as if observing a schedule that must be met at all costs. Whether it is due to financial necessity or otherwise – which may simply be the fact that he loves making movies – Allen is seemingly never without a movie in some stage of production and, as such, makes himself susceptible to accusations of privileging quantity over quality, claims that hold some weight given the inconsistency of his recent output. 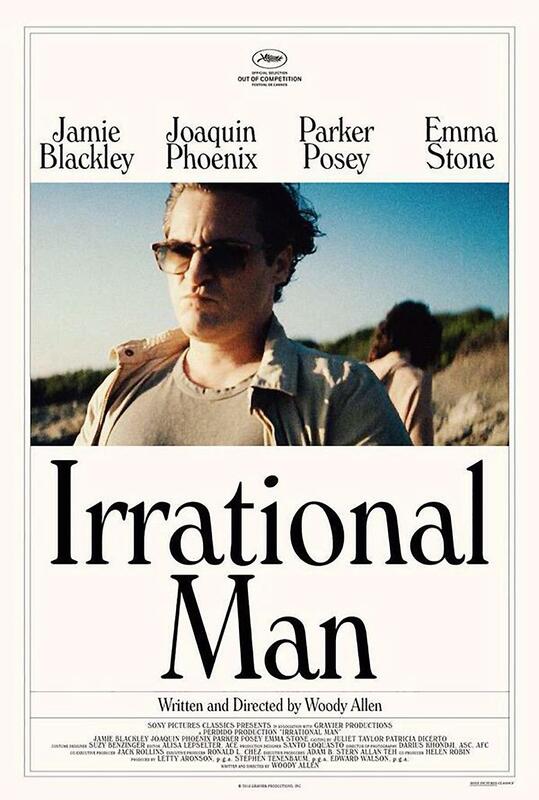 Whilst there are moments in many of his latest films that deliver glimpses of the humour and witty wordplay that make his best works so memorable, there has been a distinct lack of consistency in recent outings and this is very much the case with Irrational Man. Whilst containing Allen trademarks such as a bumbling, neurotic male lead and philosophical musings about the world, the film is hampered considerably by the screenplay; the characters are under-written and the story never really delves beyond the surface of the many topics touched upon in what is a crime caper of sorts set amidst the academic environs of a Rhode Island college. Following his turn as mutton-chopped stoner detective Larry Sportello in Inherent Vice, Joaquin Phoenix plays another left-of-centre character here as Abe Lucas, a newly arrived philosophy professor at Braylin College. A somewhat taciturn individual in the midst of a depressive funk, Abe is a former activist who really only comes to life in the classroom where he riffs on the likes of Dostoevsky, Sartre and Simone de Beauvoir. His classes, perhaps like the film itself, examine the problematic disparities between theory and practice. Despite his anti-social ambivalence, he finds himself in the sights of Rita Richards (Parker Posey), who is dissatisfied with her marriage and is far from subtle in her efforts to bed Abe. Like much of what goes on, it is not clear why Rita so desperately craves Abe’s affections because there is no insight offered into the real nature of her relationship with her husband. As a result, Rita comes across as a somewhat sad, desperate individual whose actions are difficult to comprehend. Posey, as expected, makes the best of the situation in which she finds herself but is let down by a lack of characterisation. It would hardly be an Allen film without a much younger woman becoming an object of desire for our leading man and on this occasion it is Jill Pollard (Emma Stone teaming up with Allen again after Magic in the Moonlight) a student in Abe’s class who cajoles her way into his affections. Despite the unfettered admiration that comes his way courtesy of Jill, Abe finds little reason to live until he stumbles across an opportunity to commit the ‘perfect murder’, something Allen has explored before on several occasions. In this instance though, our anti-hero is motivated by existential crisis rather than love or money, which is an interesting premise. The problem is that the motivation for this particular act is nothing more than an overheard conversation in a diner in which a jilted wife complains about her husband and the judge who presided over their custody hearing. The idea that Abe, or anybody remotely intelligent, would use this as the catalyst to plan and execute a murder is ludicrous. There seems to have been little thought given to developing the story in such a way as to provide a much more logical motive for his actions. Once the deed is done, Abe comes alive and finds himself energised both creatively and sexually (much to Rita’s delight), titillated by the idea that he has outsmarted all and sundry in executing his plan. Of course, if that was the case, it would all be over very quickly, so needless to say things begin to unravel as various parties start to connect the dots. Courtesy of cinematographer Darius Khondji, whose credits include Se7en, Stealing Beauty, The Beach and three of Allen’s last four films, Irrational Man looks terrific with the university community resplendent in all its lush, leafy finery, dappled sunlight and architectural splendour, so it is disappointing that the rest of the film isn’t as polished. In fact, the reliance on duelling voice-overs from Abe and Jill only serves to accentuate the deficiencies in the screenplay. Stone is fetching as a young woman who is yet to descend into the cynicism and disappointment of adulthood, while Phoenix is the perfect choice for the sociopathic Abe, whose personality seems an amalgam of several characters the actor has inhabited the past. Nowhere near Allen’s best work and certainly not his worst, Irrational Man is an interesting idea that is, ultimately, underdone. Maybe if Woody could just slow down and take a more measured approach to his output, he might yet produce something new that reminds us just how good he can be. Irrational Man opens in Brisbane cinemas this Thursday (August 20).